With more churches per square mile than any other country in the world there is no shortage of religious marriage venues. 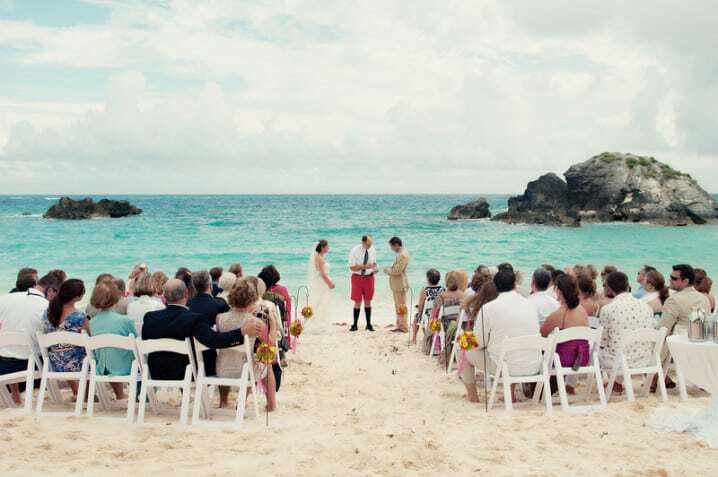 Bermuda’s laws also allow weddings in its hotels, historic houses, and on its beautiful beaches. Couples have a huge range of locations to choose from, for both the wedding ceremony and reception. Some of the best and most popular choices for destination weddings are listed below. Photographs supplied by Ace Studios, Amanda Temple Photography, and Howarth Photography. 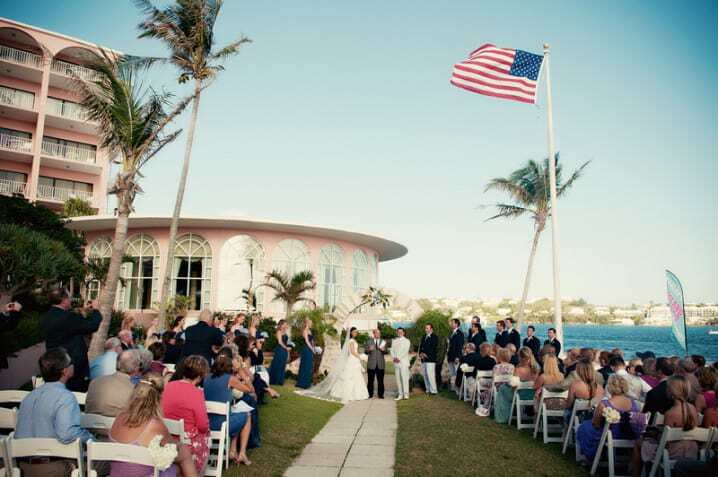 Astwood Park is one of the most popular locations for an outdoor wedding in Bermuda. The park is situated on the South Shore in Warwick Parish and overlooks Astwood Cove. The park is large and can accommodate a large number of guests. Weddings here need to be booked in advance with the Department of Parks. Alternatively your wedding planner can make the necessary arrangements. More photos of weddings at Astwood Park can be seen in this gallery. The Reefs is an award-winning, intimate hotel in Southampton Parish. It offers a variety of locations for both the wedding ceremony and reception. Small weddings can be held on the hotel’s private beach. Larger parties can be accommodated on Caso’s Point, a two-tiered wooden deck built over the edge of the resort. It offers a cool breeze and a stunning ocean backdrop. 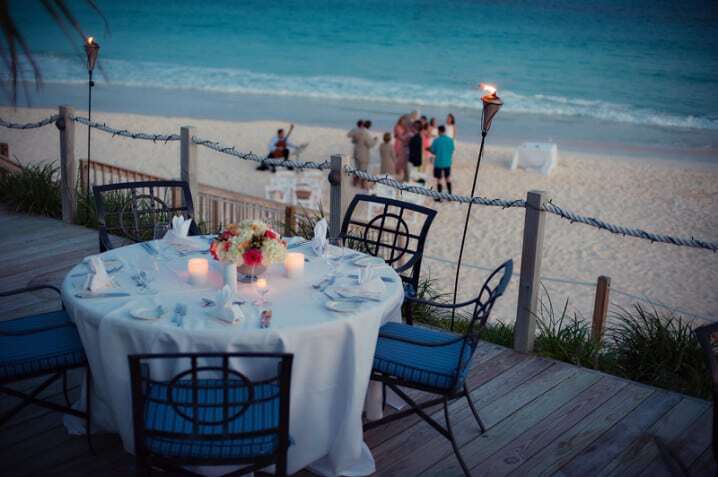 Wedding receptions can be held overlooking the beach in Coconuts or in the more formal Royston’s restaurant. Several private dining rooms are also available. 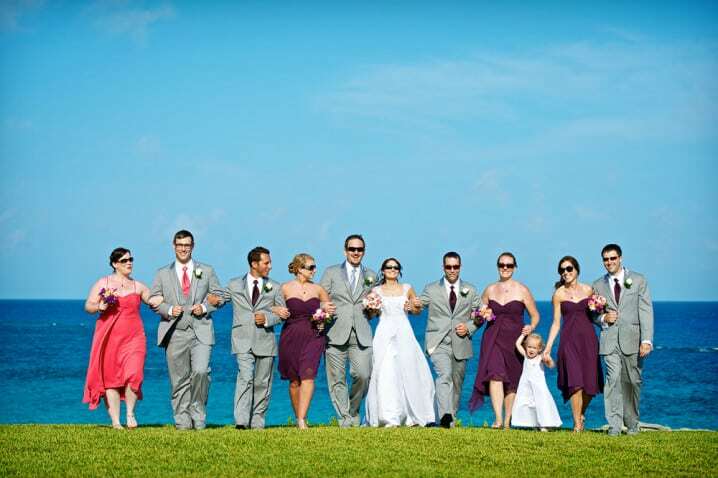 The hotel works with wedding planners Bermuda Event Solutions. They can provide assistance with all aspects of the wedding including arranging a photographer, florist, stylists, and musicians. The hotel’s pastry chef can also provide the wedding cake. A fixed-price wedding package is available for weddings of 12 guests or less. It includes the ceremony, minister, licence fee and marriage certificate, and photographer. More photos of weddings at The Reefs can be seen here. 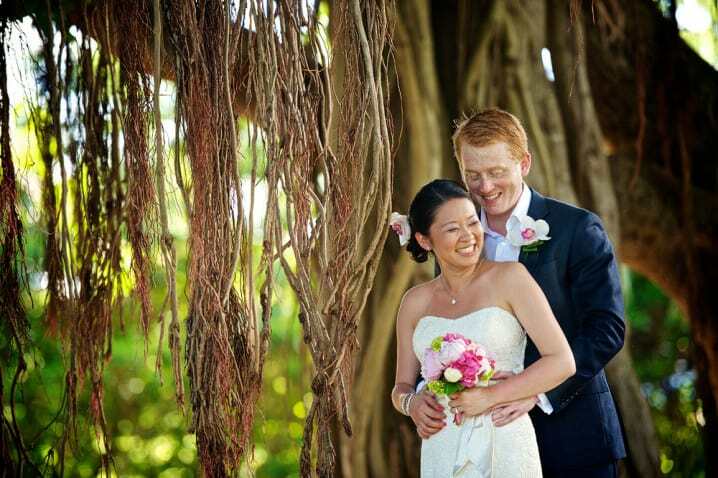 Couples wanting a garden wedding should consider the Botanical Gardens as a potential venue. Situated close to Hamilton, it can accommodate a large number of guests, both outside or in the Visitor’s Centre. For details contact the Department of Parks. This gallery shows more photos taken at the Botanical Gardens. Tom Moore’s Tavern is one of Bermuda’s most popular and opulent restaurants. It was built as a private home in the 17th century and is named after Irish poet Thomas Moore who visited it in 1804. Receptions can be held indoors or outside on the terrace or patio. More photos of weddings at Tom Moore’s Tavern can be seen here. 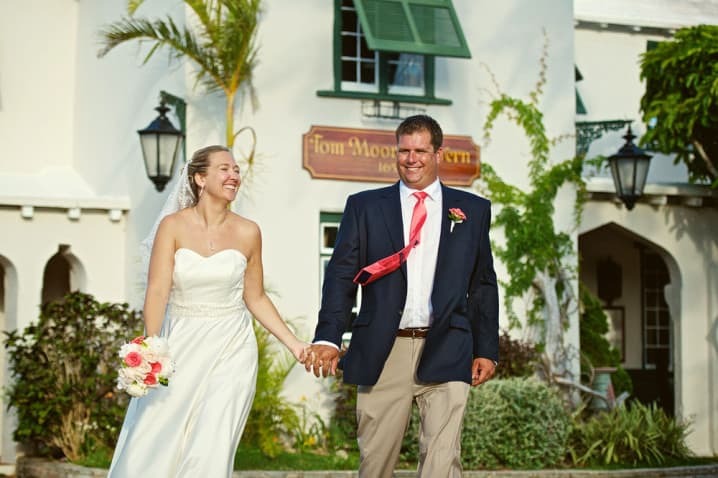 The Bermuda National Trust manages several fantastic properties that can host wedding celebrations. Waterville was built at the start of the 18th century by James Trimingham, a member of a prominent Bermudian family. In 1842 James Harvey Trimingham opened the first Trimingham Brothers store here. Today, the historic house is the headquarters of the Bermuda National Trust. The waterside property can host both outdoor and indoor wedding receptions. Ceremonies can be held in the garden with its delightful waterfront gazebo and formal rose garden. Verdmont is another popular venue. Situated on a hill in Smith’s Parish, its garden boasts magnificent ocean views and makes a spectacular setting for an outdoor wedding ceremony. Small receptions can be held in the historic 18th century house. The Fairmont Southampton is the largest resort in Bermuda. Situated on one of the highest points on the island it boasts a vast range of facilities including numerous restaurants and bars, spa, private beach, golf course, dive centre, tennis courts, and children’s club. The hotel’s in-house wedding co-ordinator can assist with all aspects of the wedding including booking rooms, and organising the catering and cake, flowers, decorations, musicians and more. The hotel offers numerous locations for both the ceremony and reception. Room upgrades and complimentary nights are offered for couples holding their wedding at the hotel. More photos of weddings at the Fairmont Southampton can be seen in this gallery. Jobson’s Cove is one of the most picturesque and photographs beaches in Bermuda. 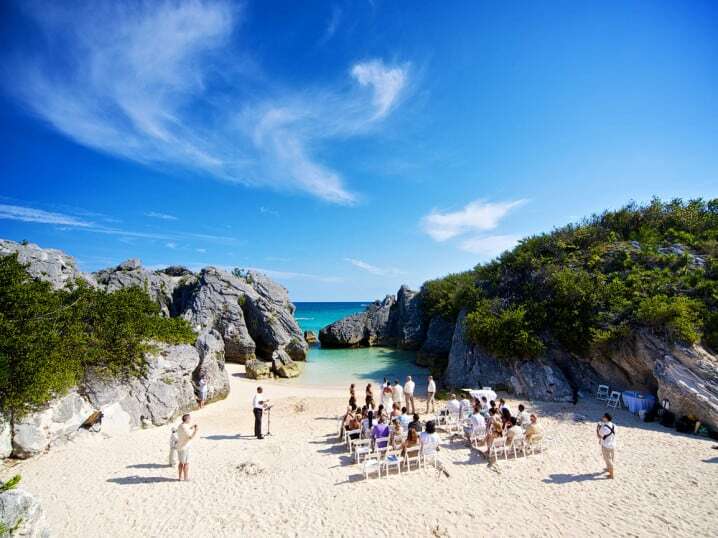 Its shallow waters are completely enclosed by steep cliffs, making a fantastic setting for a wedding ceremony. The beach can be booked through the Department of Parks. More photos of wedding ceremonies at Jobson’s Cove can be seen here. Stonehole Bay is another popular spot for a beach wedding. It’s just west of Jobson’s Cove but is more open and has views of the ocean. For further details contact the Department of Parks. More photos of wedding ceremonies at Stonehole Bay can be viewed here. As the name suggests Warwick Long Bay is the largest beach in Bermuda. It’s not crowded though and is an ideal spot for a destination wedding ceremony. It’s situated in Warwick Parish, just east of Jobson’s Cove. For booking information contact the Department of Parks. The Hamilton Princess enjoys a waterfront location in the capital, overlooking Hamilton Harbour. The hotel has an events coordinator who can assist with all aspects of the wedding. Packages are available for larger parties. The Flagpole Terrace has great views of the harbour and is the hotel’s most popular venue for wedding ceremonies. Indoor spaces are available in case of bad weather. Coco Reef is an intimate resort in Paget Parish, just east of Elbow Beach. 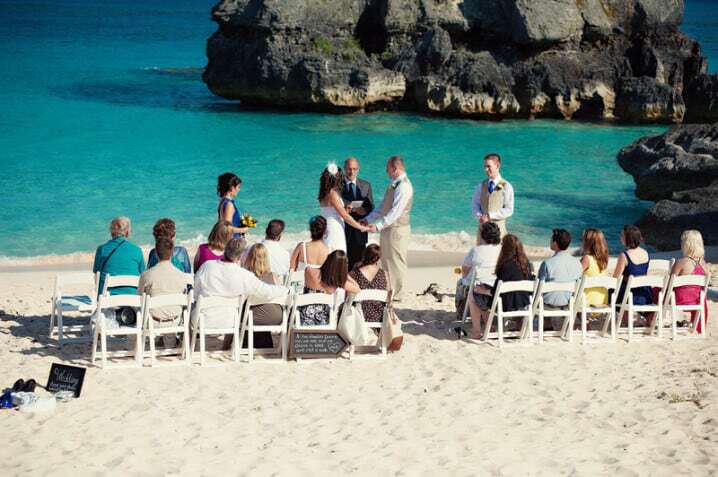 The beach here is an ideal location for a wedding ceremony. Couples can also tie the knot on West Cliff Lawn, a grassy area overlooking the beach, or High Point, a sundeck next to the swimming pool. The hotel offers several restaurants and private rooms suitable for wedding receptions. Couples looking for a truly historic location for their wedding should consider Fort St Catherine in St George’s Parish. The fort was originally built at the beginning of the 17th century, with major reconstruction taking place in the latter half of the 19th century. The octagonal fort is well-maintained and can accommodate large wedding parties. For bookings contact the Department of Parks. Rosewood Tucker’s Point is a boutique hotel in Hamilton Parish. The intimate property offers just 88 rooms but is set within the Tucker’s Point Club, an exclusive resort community that also includes an 18-hole golf course, beach club, tennis centre, and private residences. 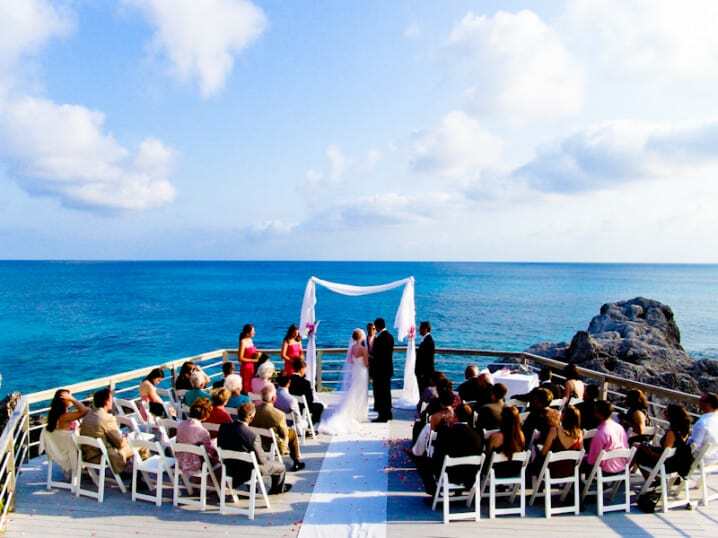 Numerous venues are available for both wedding ceremonies and receptions, both at the hotel and around the resort. More photos of weddings at Rosewood Tucker’s Point can be viewed here. Couples wanting a simple ceremony can tie the knot in the Marriage Room at the Registry General. It situated in the Government Administration Building on Parliament Street in Hamilton. Ceremonies are held on weekdays between 10 am and 4 pm and on Saturdays from 10 am until noon. For further details call 441-297-7709. Find out why it’s a good idea to hire a wedding planner for your dream day. 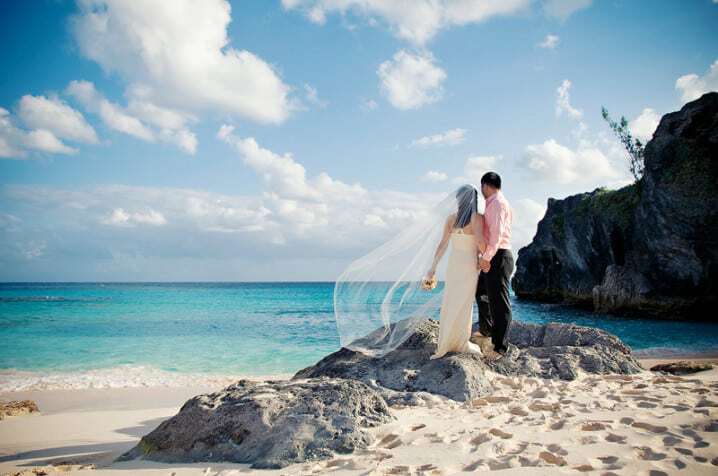 Find out what paperwork needs to be completed in order to get married in Bermuda.